Would you like to take your Army career to the next level? Are you ready to get the promotions you deserve and the jobs you want? If you answered YES to either of these questions, I’m here to help. My name is Charles Holmes and I am the creator of Part-Time-Commander.com, one of the leading websites in the world for part-time Army Soldiers, NCOs and Officers serving in the Army National Guard and Army Reserves. I created this website to help part-time Army leaders get the mentorship they need to succeed. Having spent 15 years in the military myself, I found that one of the biggest issues Soldiers, NCOs and Officers struggle with is goal setting! Yes, I said it, GOAL SETTING. Now, I know that might sound crazy to you for a moment. But, please hear me out before you just brush this idea off as a crazy idea. You see, if you ask 100 Soldiers, NCOs and/or Officers EXACTLY what they want to achieve in their Army career, at least 98 to 99 of them can’t answer the question specifically. Yes, you will get responses such as “to get promoted” or “to retire after 20 years” but all of the answers are “winged answers” and are not specific goals. In other words, most Soldiers don’t know how to set career goals properly. Most Soldiers have not made the time to sit down and MAP out their Army career (in writing). In fact, most Soldiers spend more time planning for their yearly vacation than they do planning their own career. As a result, most Soldiers don’t fulfill their potential. I’d be bet that most Soldiers don’t even use 10% of their potential. I don’t want you to be a victim and waste your potential, so I’m here to offer you some help. I’m personally a huge fan of setting written goals. Setting written goals has completely changed my life for the better, and I know it can have the same impact in your life. This audio course and manual is designed to teach you how to set written career goals AND it will walk you through the process of actually doing it! 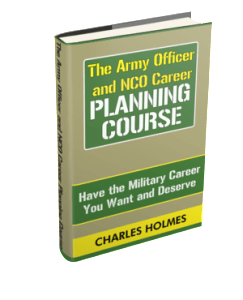 By the time you finish listening to my course and doing the exercises, you will be in the top 1% of all Army personnel because you will have written career, five-year, one-year and one-month goals. And more importantly, you will have a series of action steps to follow to make sure you reach your goals. Here’s what you will get in my course. Why some people have successful careers and others don’t – Discover why some Soldiers achieve great things while others achieve mediocrity in their career. Why having talent is not enough – Learn why being smart or motivated or good at your job is just the starting point to career success. Case Study About Goal Setting – Learn about a 1979 Harvard Case Study about goal setting. If you “get it” this will blow your mind. My Experience in the Army – Discover what I learned about goal setting during my 15 years in the Army and how it helped me personally. Why People Don’t Set Goals – Discover the common reasons why most people don’t set written goals for themselves. The Importance of Setting Written Goals – Find out why setting written goals is so important. How to Set Goals for Your Military Career – Follow my seven step process to set your own goals and develop your own action plan. This is the meat and potatoes of this course. Final Tips for Success – Check out my final tips on how to set goals that are achievable and realistic. On this data CD you will get my 8-page report, “The Army Officer and NCO Career Planning Course.” This is a PDF file you can print out our save to your computer. This is where you will type in your own goals and do the exercises. I’ve also included my suggested reading list for topics on goal setting. In review, you will receive 1 audio CD and one data CD via email. These will be in a ZIP file format that you can download and save to your computer. Once you pay by Paypal, you will get the materials emailed to you immediately. *** You need to know something. As I see it, this is the most important product that I sell. Of all the things I credit to my career success, goal setting is at the top of the list (along with reading). And I don’t say that lightly. If you do the exercises in this course and apply what you learn, you can receive a huge return on your investment. How much would a couple additional promotions and a larger pension be worth to you? I think it would be worth a lot more than I am charging for this course! Order Now! This Offer Could Be Removed at Any Time! Satisfaction is always guaranteed. I offer a 30-day, no questions asked money back guarantee on everything I sell. If you are unsatisfied with your purchase for any reason, just contact me to get your refund. NOTE: Secure payment is through PayPal. You can order 24/7. Your item will be delivered via email. Disclaimer: The views in this course are my own and are not endorsed by the DoD, the Army, Army National Guard or Army Reserves. This is not a government endorsed course. It is created my Charles Holmes, owner of Part-Time-Commander.com. The material is copyrighted. Unauthorized reproduction or distribution is strictly prohibited. P.S. How much is your Army career worth to you? Can you justify spending $10 to learn how to set goals and create an action plan so you can have the Army career you want and deserve? I hope so! Even if you learn and implement just one idea from this course, you will get a huge return on your investment.